"Challenge and inspire your teenage learners to think beyond language. 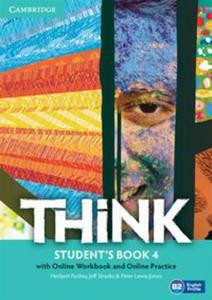 Think is a fresh, vibrant and upbeat course designed to engage teenage learners and make them think. As well as building students' language skills, it offers a holistic approach to learning: developing their thinking skills, encouraging them to reflect on values and building self-confidence. Topics are chosen to appeal to and challenge teenagers, firing their imagination and ensuring effective learning. This version of the Student's Book includes access to the online learning management platform with full Workbook content online plus further practice and interactive video activities. Teachers can use the platform to track students' progress and ensure more effective learning." 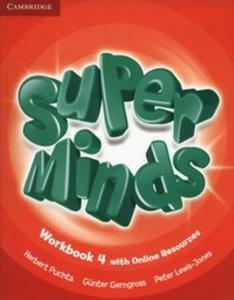 Super Minds is a seven-level course for young learners. Super Minds enhances your students' thinking skills, improving their memory along with their language skills. This Level 4 Workbook includes activities to develop language creatively, cross-curricular thinking with fascinating 'English for school' sections and lively stories that explore social values. For each Student's Book page, this Workbook features a page of activities. Students also have access to an online platform with games and supplementary grammar, vocabulary and reading activities. All the students' online work can be tracked and reviewed by the teacher.